It is also know as Kwangde RI. The peak is a challenging climb. It forms an impressive multi-summited ridge on the eastern end of Lumding Himal, which in turn is a part of Rolwaling Himal. 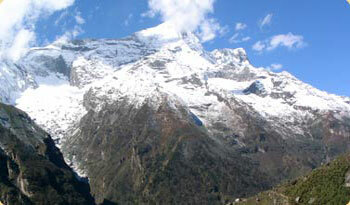 The peak stands above the Bhotekoshi River, southeast of Namche Bazaar. The northern part of the peak forms an impressive barrier having several steep ridges to the north. Panoramic views of Mt. Amadablam, Mt. Everest, Mt. Nuptse, Mt. Lhotse, Makalu, Baruntse, Thamserku, Tashi Peak, Kusum Kangru, exploring Thame village and Namche Bazaar. Day 01 : Meeting upon arrival at Kathmandu International airport by our representetive, transfer to hotel. Day 02 : Stay at Kathmandu for the official procedure & sightseeing, overnight at hotel. Day 03 : Fly to Lukla and start trek to Phakding, overnight at tented camp. Day 04 : Trek to Lumding Kharka, overnight at tented camp. Day 05 : Trek to Pokhari Camp, overnight at tented camp. Day 06 : Trek to Kwangde base camp, overnight at tented camp. Day 07 : Climb to Kwangde high camp, overnight at tented camp. Day 08 : to Kwangde Peak and back to high camp, overnight at tented camp. Day 09 : Back to Base Camp, overnight at tented camp. Day 10 : back toward Thame village, overnight at tented camp. Day 11 : Stay at Thame, overnight at tented camp. Day 12 : Trek to Namche Bazaar, overnight at tented camp. Day 13 : Trek to Phakding, overnight at tented camp. Day 14 : Trek to Lukla, overnight at resort. Day 15 : Fly back to Kathmandu, overnight at hotel. Day 16 : Rest at Kathmandu, overnight at hotel. Day 17 : Transfer to airport, departure onward destination. Please note: We have more fixed departure climbing peaks booked for 2012/2013, please contact us for details.